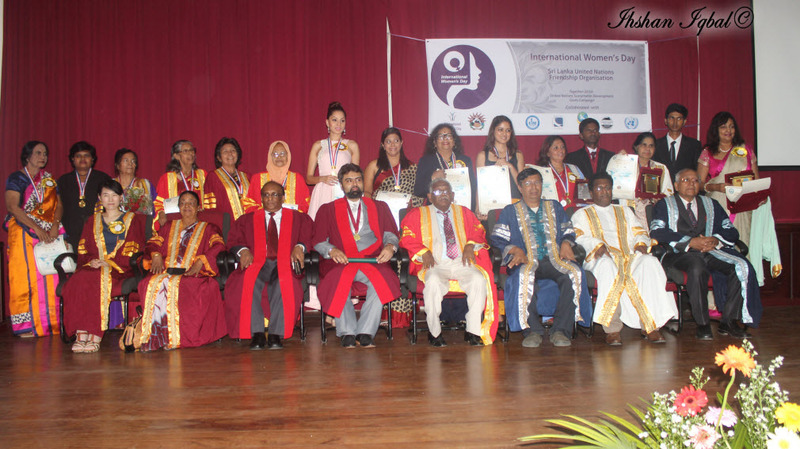 CIAC (Confederation of International Accreditation Commission) with SUNFO (Sri Lanka United Nations Friendship Organisation) & CIHF (Confederation of Indian Healthcare Foundation) celebrated International Women’s Day, 2016 held at the National Musuem of Sri Lanka Auditorium, Colombo on 31st March, 2016.Presentation of International Women’s Excellence Awards 2016, IWD Appreciation Awards and SUNFO Supportive Fellowship Awards were done. Prof.Dr. GD Singhwas presented the distinguished award of“Peace & Diplomacy Brigadier of the New Millennium”With due consideration of his innovative and dedicated service to the globe towards achieving of Millennium Development Goals declared by the United Nations for the period of years 2000-2015. Dr. GD Singh is the Chairman of CIHF and President of CIAC Global which is a global organization working for quality assurance. He was earlier given the “Medicina Alternativa Trust Award” on 30th march, 2016 by the International Accreditation Forum, Sri Lanka for Humanitarian Services and initiative to promote world peace. Welcome address delivered by Ambassador of Justice Madam Sitty Ayesha Zain Trustee/Treasurer-SUNFO). Then UN Secretary Genera’s IWD Message delivered by byspecial Representative Madam Deborah Whitaker.Then Congratulatory messages by; Firstly from International Women Peace Group South Korea Global Head Quarters Special representative Madam HanhahRoh and Secondly Chief Guest of Honour Ex Director General of ASEAN Ambassador His Excellency DattoDr.AnandaKumaraseri. Presentation of International Women’s Excellence Awards 2016, IWD Appreciation Awards and SUNFO Supportive Fellowship Awards were done. Prof.Dr.GD Singh was honouredas “Peace & Diplomacy Brigadier of the New Millennium”.Cultural Items namely “Women & Tea Plantation” and “Women’s role in Coir Industry” were presented by Arrawwala East Thilaka Rangayathanaya. Vote of Thanks delivered by SUNFO women Affairs Adviser Justice of Peace Madam Padma Colonn at the end of the ceremonial session with honouring SUNFO SONG. Maliban Group provided refreshments and thereafter Workshop on “Women and Sustainable Development Goals ‘ conducted.Event organized by a team of volunteers led by SUNFO Project Director Ms.Kanchana Ariyaratna. Women & Sustainable Development Goals Workshop organized by the SUNFO collaborated with GCAP, IWPG, CIAC Global& CIHF was also held at National Musuem of Sri Lanka, Colombo on 31st March, 2016. SUNFO Director General, GCAP Coordinator Peace Ambassador Dr.DeshapriyaS. Deshapriya Wijetunge did the introductory note and inviting Resource persons. Dr.Ms.Nela Gunasekera(Ex.Chairperson -National Women’s Committee of Sri Lanka) did a presentation about the SDGs in Sri Lankan Women’s Perspectives. Ambassador Datto Dr.Ananda Kumarasiri (Former Director General of ASEAN) spoke about UN SDGS Role of Women. Ms.Hanah Row (Representative of International Women Peace Group) spoke about IWPG and Peace of Women as a Sustainable Development Goal. Participants were received a Certificate of Participation.